The Hurt Locker is a well paced realistic look at a United States Army Explosive Ordnance Disposal team during the Iraq War. The film is about a highly skilled team leader of an Explosive Ordnance Disposal unit play by Jeremy Renner. He rubs the rest of his team the wrong way because he likes to do everything is own way, even if it is extremely dangerous. The film is about him connecting with his other teammates as they are put in many risky situations. The pacing was the first thing I noticed about the film because it starts off with a bang. The film continues this trend by feeding the audience a healthy amount of downtime of the soldier just living, between all the thrilling action. The opening of the film also makes the statement that anything could happen at any time. So all the characters did feel like they were in danger all the time, unlike many other films where main characters are completely invincible. Along with that, the films visuals had a quality to them that made you feel as if you were watching a real life documentary, unlike most unrealistic Hollywood movies. The near documentary style helped make the characters more real and thus allowing the audience to connection to the characters more and have them appear to be in greater peril. Even though the film is fictional, it puts perspective on the idea that this is a very real job that people actually risk their lives doing. Overall the film is a very interesting look at the nearly unbelievable job and life of the main character, plus his wife is Evangeline Lilly. Out of the 10 Academy Award Nominated For Best Picture Of 2009, I would have to place it in the middle of the list of my favorite. Not only is the film up for Best Picture but for Best Director. The director is Kathryn Bigelow, who is the ex-wife of James Cameron. His film, Blue Aliens Are From Pandoria And Under Developed Characters Are From Earth, is also nominated for Best Picture and Best Director. This fact does not actually matter, but Hollywood’s second biggest export behind movies is celebrity gossip that does not effect anyone but the ones who are involved. 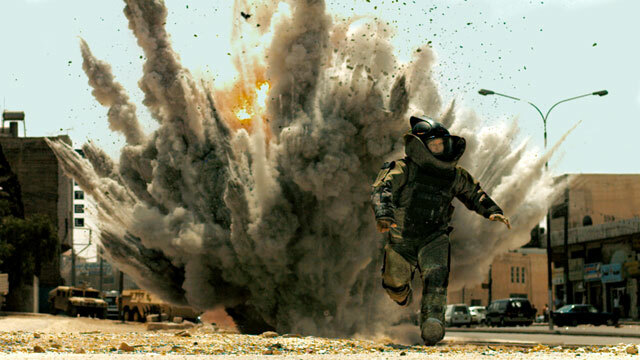 Congratulations to The Hurt Locker for winning Best Picture and Best Director among many other awards. It might have not been my favorite out of the ten Best Picture Nominees, but I completely understand why it won Best Picture and happy that it won because it beat out the majority of other films that did not even deserve the award. I havent seen hurt locker yet, but after hearing it won best picture, its definately motivated me to watch it take care ! !